I like LOVE snow. Being from the South, I never really got to see snow. So living up North has been a treat for me with the snow. However, I'm still not a fan of driving in it. But now that I'm a stay at home Mom, at this point, getting out in the snow will be mostly optional unless we have an appointment that we have to keep. 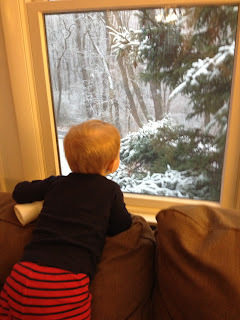 But we woke up to a little snow and got to watch it snow most of the day yesterday. It wasn't enough to get out the snow shovels, but it was enough to make things pretty. Lil man saw snow last year, but he wasn't really big enough to enjoy it. His eyes lit up when he saw it yesterday. I'm not sure if he will like playing outside in it. But he enjoyed the view.